Home / Tech Tips / How to Rank Youtube Videos in SEO? Choose Keywords For Ranking,Use Keyword Planner. How to Rank Youtube Videos in SEO? Choose Keywords For Ranking,Use Keyword Planner. Hi guys in this article I am explain about youtube SEO. first of all my english is not quite good. so i write simple article.i hope you can understand my simple english. Let's start, when someone search any video on Youtube search bar like how to make editing videos, so you can give a title like that and you can use tag like that. Stay reading I'll explain perfectly. so guys if you upload a video in youtube about video editing so you must give video related keywords. Keywords​ means tags. if you want to rank your video on Youtube then you must have to give many tags about your video related. If your tags or title is related as your video then youtube controller can rank your videos on Youtube seo(search engine optimization). This is a really very important question. Don't worry I give you a simple way to get SEO related keywords. it's really very simple. first of all if you have a android mobile or pc whatever you must have Chrome (specialy for mobile). (1) you must need Chrome browser on your mobile or pc. (2) open browser and create a new tab and right on request desktop. (3) then go to search bar and search https://www.keywordtool.io/Youtube. 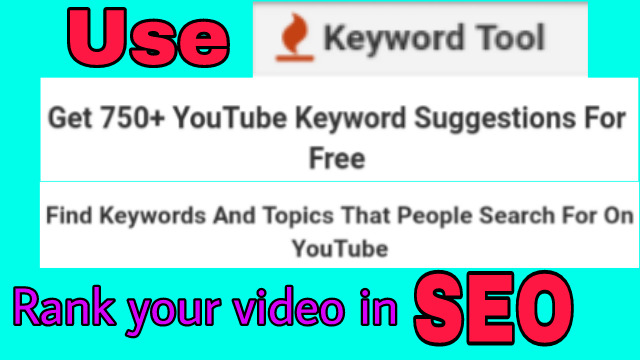 (4) and next thing you must type search bar one or two keywords about your video. (5) then choose your​ country and language. 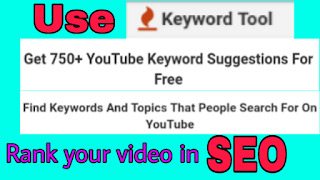 then you get more than 30 keywords or tags for your youtube video. you can copy all or if you don't want to copy all then you can choose what you want and copy that's keywords from down of right side . and you get more than 4/5 title for your​ video SEO related. all keywords are SEO related. so you can use for rank your videos on youtube. you need to focus on your videos. when your videos have good content, seo related keywords or tags and video related title then your videos going to rank and viral. then your video watched by all over world. I hope this article is helpful​ for you and your youtube channel. you can visit my youtube channel for more information about tech and video editing. and please like us on facebook​ fan page that is som technical. that all have a good day.